Just after we finished a great workshop! It was so nice to meet you all! I have been giving Digital Media Story telling workshop for 4 years. Every year the number of attendees in United States is getting higher. I feel so privileged to be invited two times by Fairfax Public Access TV Station last month. The content was very interesting. From the early ages of human history to current day. From the cave men drawings to Instagram Videos. It is all about story telling and understanding the beauty of being more aware as a viewer. I can not wait to be invited to another workshop series sometime in the future. 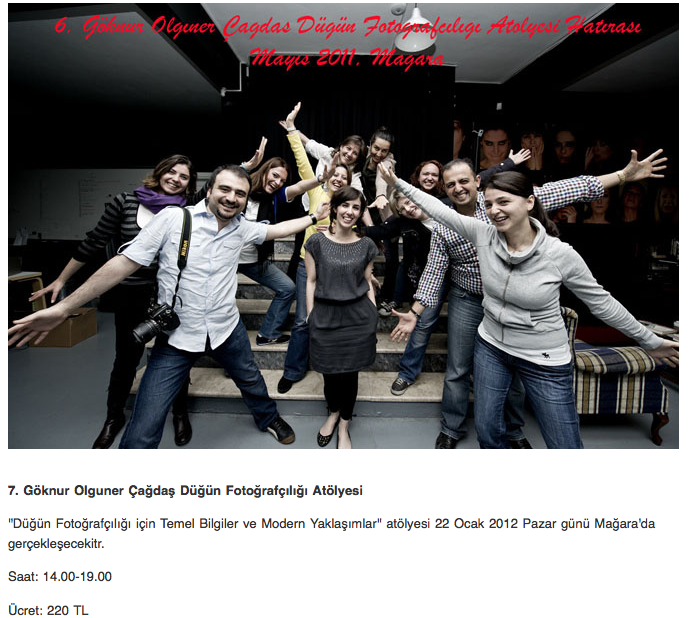 Thank you everybody for attending Contemporary Wedding Photography Workshop in Istanbul!! I just received this beautiful picture from Istanbul Contemporary Wedding Photography Workshop host Muammer Yanmaz.It was such a beautiful day with great people. Thank you for all the phone calls and e-mails after the workshop. I decided to share some of the e-mails (only the good ones:) with my curious fans. I had been invited by Muammer Yanmaz to speak at his famous workshop series in his Mecidiyekoy, Istanbul Studio this weekend as a Contemporary Wedding Photographer. This will be the first Contemporary Wedding Photography workshop that will hold in Turkey and I'm so exited and so grateful to be part of this project. Here is the snapshot from Haber Turk.